Posted July 12, 2017 (edited) · Cura stringing on supports. I've been using my first 3D printer for 6 months, so I've learned a lot about configuring Cura on advanced settings (retraction, temeperature, infill, support towers, infill and support patterns, etc. ), and it´s a great slicer if you know what you are doing. I´m using Cura 2.6.2 right now. ... but, I miss something in the configuration settings. I know how to fix stringing problems in the actual model (retraction, printing temperature and speed), but this retraction settings doesn't affect to supports. It seems that it's configured by default by not retract on supports. I know the benefits of not retracting on supports. 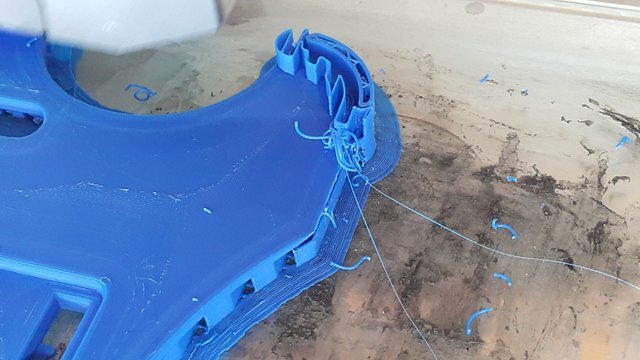 Better printing speeds beacause you don't really need acuracy and good finish on supports, beacause you are going to remove them after printing. I also know that on traveling between supports the nozzle avoids final print areas in order to avoid meshing the stringing between supports with the final print. The problem comes when you have several thin support areas, like support towers. I'll try to explain it. In each layer the slicer prints the support areas first but without retraction, then it performs a retraction, moves to the model print area and begins to print. If it needs to change between model print areas, it performs a retraction and changes its position. In theory, it should avoid stringing between supports and the model. But, it is not always true. For example, If you have 3 support towers with a 30mm gap between them, the printer prints the first tower layer, and its ok, then performs a travel to the second one without retraction and performs 30mm of stringing, emptying a bit off the nozzle, then it tries to print the second tower first layer, but in the beginning it hasn´t enougth material and result in an incomplete weak layer, then it´s the same on the third tower. On the next layer it's the same, but beacause of the incomplete layers on the 2 last towers, the filament doesn't sticks correctly, and sometimes the material goes with the nozzle instead of being in its place. The result is a tangled deformation of the tower towards the traveling direction. And if the deformation is enough to go out of the theorical support surface, the tower breaks and the material goes with the nozzle and gets sticked to the next support or even the model, ruining your print beacause of the material sticked to the model and the lack of complete towers. I´ve tried to configure wider towers, horizontal expansion of supports, lowering support speed, but it doesn´t solves it at all and wastes filament and time. With retraction it shouldnt happen. It will take more time, but sometimes waiting a bit more is better. Could be possible to add a "Enable retraction on supports" option to Cura to solve it in next versions? If you have another solution on the actual software without retraction that I haven't tryed, please, answer this question too. I will apreciate it. Posted August 12, 2017 · Cura stringing on supports. Im having the same problem, there are parts that I need to manualy crack strings from each layer..